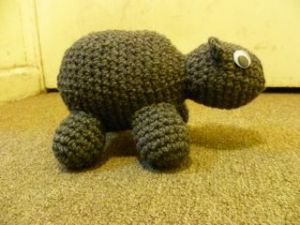 Also, this pattern is ridiculously easy and would make a good project for a beginner. The wombat is 18 cm long. 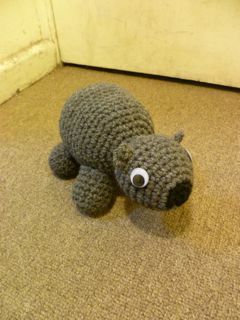 He is made using grey and black 8ply wool and 4 ply hook. This pattern is written in American crochet notation. Attach grey wool to a spot behind an eye, chain 3, double-stitch in the same stitch, double-stitch in the next stitch, fasten off, weave in ends. Stuff the legs and sew them to the body. 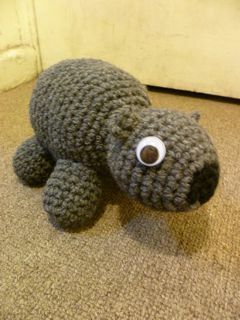 Sew on the eyes and then crochet the ears.